The Post might have been nominated for a bunch of Oscars, but it wasn’t very much fun. The BFG should have been magical and heartbreaking but instead it was long and boring. Tintin was rubbish, Lincoln was dull, War Horse was over-sentimental and we don’t even want to talk about Indiana Jones and The Kingdom of The Crystal Skull. And okay, Bridge of Spies was a fine film but it wasn’t exactly what we come to Steven Spielberg for. Ready Player One, however, is. It’s perfect for the ‘Berg, it’s his best in ages and we can’t imagine it done this well in anyone else’s hands. Based on the very popular 2011 YA novel by Ernest Cline, Ready Player One is a movie which will appeal to the kind of people who are obsessed with early Spielberg films – indeed the book is packed with Easter eggs and references to his back catalogue. Though Spielberg eschews any homages to himself, the film is still rammed with references – it’s a paean to pop culture, a love letter to the ’80s and a glorious, good-hearted adventure that will please kids and remind grown-ups how they felt watching Spielberg’s early works the first time around. 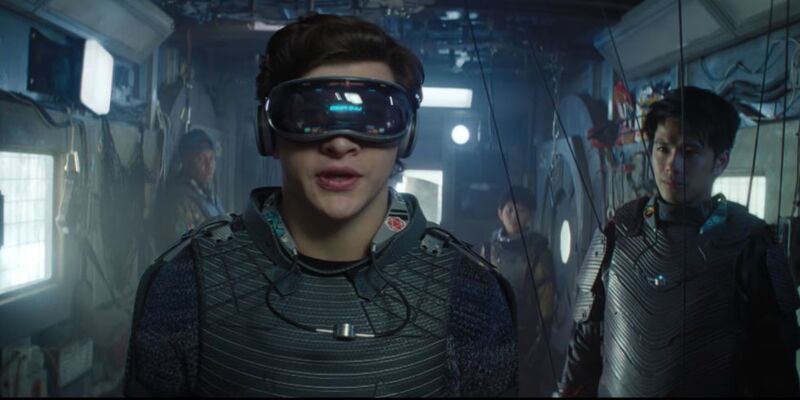 Tye Sheridan plays Wade Watts, an orphaned, lonely and disaffected teen who spends his life, like most other people, plugged in to The Oasis, a massive virtual-reality world where just about anything is possible. His reality is far less shiny – global warming, overpopulation and widespread poverty have led to the majority of people living in a slum-like pile-up of motor homes known as The Stacks. Wade lives with his aunt and her abusive boyfriend, and has few friends other than those he’s met online. Meanwhile in The Oasis, a glimmer of hope has been offered to the masses. When the creator of The Oasis, James Halliday, died he sent a message from the grave. Inside The Oasis, he has hidden three ‘keys’ – whoever finds all three will win his virtual Easter egg, and more importantly control of The Oasis, a trillion-dollar business. When we join Wade, the search has been going on for years. Dedicated egg hunters (‘gunters’ for short) have trawled Halliday’s records and scoured the four corners of The Oasis looking for a head-start. Meanwhile corrupt conglomerate Innovative Online Industries (IOI), headed up by gleefully sleazy Nolan Sorrento (Ben Mendelsohn sporting blindingly white veneers), employs hoards of staff to mount a coordinated search – these faceless avatars are known as ‘Sixers’ after the fact that they have no names in The Oasis, just numbers. Flipping between the gorgeous CGI fantasy land of The Oasis and the grim reality of The Stacks, RP1 does an excellent job of avoiding the potential pitfall of a lack of real-world peril. While we don’t intrinsically care about some avatars getting shot by virtual robots or losing the virtual ‘coin’ they have accumulated, the danger turns real when Sorrento discovers who Parzival is in real life and threatens his family. The quest gets political too, when Wade joins forces with a beautiful avatar calling herself Art3mis – she’s an activist determined to win the egg to keep The Oasis in the hands of the community and shut down IOI, who are driving players in the real world into debt and despair. Not super-sophisticated, then – but this is a movie aimed at young people and it’s a simple and honourable cause that’s easy to get behind. The biggest weapon in Spielberg’s arsenal is his cast. Tye Sheridan, who’s put on a touch of weight and geeked himself up since X-Men: Apocalypse, is vulnerable and sympathetic – Parzival is a total dude but Wade’s an isolated and naive teenage boy who’d very much rather be kissing girls and playing computer games than saving the world. Olivia Cooke as Art3mis is never less than captivating and Lena Waithe as Parzival’s online bestie makes a great side kick. Then there’s Mark Rylance as James Halliday from beyond the grave – a socially inept uber-nerd with a good heart. It’s difficult to imagine a Mark Rylance performance which doesn’t make us cry – and, once again, he didn’t let us down in that regard. Mixing wild CG action scenes with gentle humour and an uplifting storyline about friendship, love, and not wasting your life playing computer games and watching ’80s movies, Ready Player One is a heart-swelling experience. Slightly over-long at 2hrs 20mins (Spielberg is rarely brief), it’s completely engaging even though it’s pretty obvious where the narrative is going. The references are nice (including a nifty The Shining sequence) but far from being a fan-boy self-indulgence, RP1 is a movie for everyone, itself a perfect Oasis of escapism against our own grim reality. It’s what Spielberg does best. Ready Player One is in cinemas on March 29 in the UK and US.